Here is one for an Easter collection. I am always trying to figure out a way to make potatoes especially for special occasions like Easter, Thanksgiving and Christmas. Here is one easy and unique recipe that tastes delicious! 2) Heat 2 tblsp butter in a saucepan over medium heat. Cook and stir garlic in the melted butter until fragrant, about 1 minute. Add 2 tblsp flour to garlic mixture; cook and stir until mixture is smooth and thickened, about 2 minutes. 3) Slowly pour milk into flour-butter mixture while continuously stirring with a whisk until sauce is smooth and thickened, about 5 minutes. 4) Remove saucepan from heat and stir Parmesan cheese into sauce until cheese melts from the heat of the sauce; season with salt and pepper. 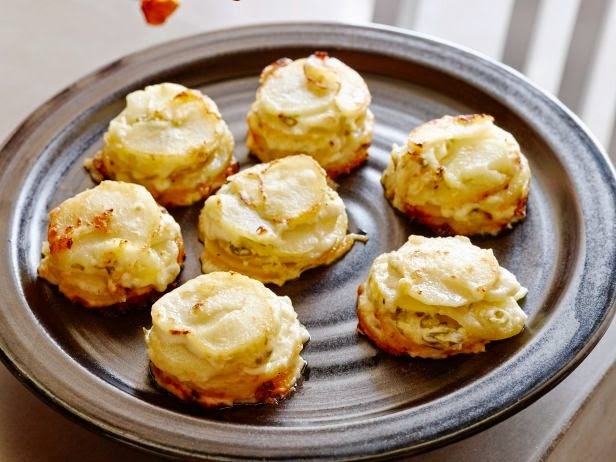 5) Divide the potatoes among the 12 prepared muffin cups and spoon cheese sauce over potatoes. Chives and dill are optional. 6) Bake in the preheated oven until potatoes are tender, about 25 minutes.